It’s been twenty years since Soho Crime published Cara Black’s debut novel, Murder in the Marais, which introduced the world to her supremely fashionable Parisian P.I., Aimée Leduc. Eighteen books and many more villains (not to mention boyfriends) later and Leduc is still going strong. One of crime fiction’s most dynamic heroines, Aimée has taken readers along with her on the back of her pink scooter as she navigates narrow Paris passages, more than one dangerous conspiracy, and the vicissitudes of motherhood. Although Cara Black is celebrated for her vivid depictions of Paris—from the wafting smell of freshly baked baguettes to the plinking of francs on the zinc counter-top of the corner café—her novels are equally enjoyed for the way they reveal hidden quartier history. Whether it’s the tragic and often ignored story of the fate of Jews during the Vichy government she depicts in Murder in the Marais or the ugly aftermath of French North African colonialism as rendered in her latest, Murder in Bel-Air, Cara Black has captured both the City of Lights and its more noir underworld as few Americans ever have. If you’re seeking a fashionable tour through Paris, look no further for your guide than Aimée Leduc. Follow her as she rides her scooter through cobblestone streets, for Aimée knows all the secrets of Paris: the best flea markets at which to buy Hermès scarves and Vuitton bags (or Birkin, if you prefer); the best bistro to drink a Perroquet (a popular mint-flavored French cocktail made with Pernod Anise); which hospital was built to contain plague victims; and which fabric warehouses in the Sentier district were once hôtel particuliers belonging to royalty the likes of Madame de Pompadour (mistress of Louis VX) and Empress Josephine Bonaparte. Whether she’s wearing Louboutin heels and a Courrèges A-line skirt or red high tops and a denim jacket, Aimée is the perfect embodiment of effortless Parisian chic. “But you must understand, a Parisienne builds a seasonal wardrobe. Invests in certain basics, the foundation,” she advises in Murder Below Montparnasse. “A good bag, coat, or jacket and heels. Then it’s simple to mix and match.” Aimée is nothing if not tasteful in matters of couture and cuisine. If you want to experience Paris like a local and don’t mind a few corpses with your croissants, then let Aimée show you the darkest corners of the City of Light. Aimée Leduc is a private detective who specializes in cybersecurity, but often stumbles upon murder cases. A triple threat, she is tech-savvy, tenacious, and always tastefully dressed. On the case or at the café, Aimée wouldn’t be caught dead without a drop of Chanel No. 5 on her throat or Chanel Red for her lips. Prepared for any emergency, she even keeps a spare set of heels and a wig under the seat of her pink Vespa. She lives across the Pont Neuf on the Ile. St. Louis, an island on the Seine nestled between the Left and Right Banks, in a 17th-century apartment that once belonged to her grandfather. At one point, it was owned by the Duc de Guise, who was later assassinated by Henri III. It may be drafty and cold in the winter, and the plumbing doesn’t work so well (inheritance taxes and renovation costs have prevented her from selling), but who’s gonna complain when you’ve got a view of the Seine from your window? A third-generation détective privé, Aimée has sleuthing running deep in her blood. Leduc Détective, the family business, is located at 18, rue de Louvre (and yes, she can see the legendary Musée du Louvre from her office desk). Her grandfather Claude started the agency, which was then run by Aimée’s father, Jean-Claude, an ex-flic whose murder Aimée witnessed in a car bombing at Place Vendôme. Her father’s death is not the only mystery haunting Aimée: her American mother, Sydney, suddenly and mysteriously disappeared when Aimée was eight. Juggling family secrets while keeping the business going becomes even more challenging with the arrival of Aimée’s baby daughter, Chloé—but with an extra espresso or two, there’s nothing Aimée can’t handle. Assisting Aimée is an entourage of friends and family members who aren’t afraid to roll up their sleeves and get their hands dirty (but only metaphorically—hopefully, their silk sleeves aren’t actually dirtied!). Her partner-in-crime, René Friant, is a friend from her days at the Sorbonne and a computer genius who always has Aimée’s back, whether that means doing a bit of snooping on his own or covering for her at a meeting with an important client (especially with a big, usually much-needed paycheck). Like Aimée, René is always dressed to kill in his tailored suits, silk shirts, and linen pants. He drives the streets of Paris in a customized 1968 Citroën DS. And don’t let his small stature fool you—he’s got a black belt! There’s also Martine, a friend from Aimée’s lycée days, now a journalist who often helps her with research; Inspector Morbier, Aimée’s godfather and first gendarme partner of her father’s, who can be cold and stubborn but always comes through for Aimée when she needs him most; Serge, her contact in the local morgue; Sebastien, her cousin, whom she helped to enter rehab; and who could forget Miles Davis (which sounds particularly adorable in a thick Parisian accent, Meels Daveez), a Bichon Frisé puppy rescued by her grandfather. Leduc’s latest investigation, Murder on the Left Bank, takes her to La Rive Gauche on the southern side of the Seine. The case begins when Éric Besson, a distant relative of Aimee’s friend Martine, asks Aimée to look into the murder of his nephew, Marcus, who was supposed to deliver the state prosecutor a notebook detailing decades of money laundering by dirty cops. Before completing the delivery, however, Marcus hid the notebook and went to a hotel with his girlfriend, where he was killed without revealing the notebook’s location. Aimée agrees to get involved not only for Éric Besson, but also because the missing notebook may hold the clues to her own father’s murder, even if it turns out to incriminate him. But when the killers threaten her daughter, Chloé’s, safety, Aimée must decide just how important it is to uncover the truth about her parents. Searching for the missing notebook and eluding the Hand—the network of cops who would kill to find the incriminating notebook first—takes Aimée on a scenic and frequently delicious, albeit dangerous, tour of the 13th arrondissement. Aimée visits La Petite Asie, Paris’ Southeast Asian neighborhood, looking for Marcus’s missing girlfriend. Later, she visits La Manufacture des Gobelins, a factory on the Bièvre River that dates back to 17th century and produced tapestries for Louis XIV and later Napoleon, where the crooked cops’ bookkeeper worked and lived. The author behind this fashionable, fantastic world of eighteen dazzling, noir-tinged investigations is Cara Black. Richly detailed with culture and history, Black’s series is rendered with the geographic intimacy of a flâneur and a cinematic panache that evokes some of France’s finest auteurs, from the poetic realism of Marcel Carné to the moody intrigue of Claude Chabrol. Like an urban excavator, Black builds her plots from the complex sociopolitical threads of Paris’s past and present: the specters of World War II, the Holocaust, and the Occupation; the radicalism of the 1970s; the reactionary conservatism of the 1980s and 1990s; and the recent wave of gentrification that revitalized the city as it erased the city's seemingly ever-present sense of antiquity. The Aimée Leduc investigations may be fiction, but their drama is very real. Like a masterful pâtissier, Cara Black deftly balances light and dark, entertainment and edification. Paris! So many beautiful, historical places to find corpses, so little time to see them all on one trip. Aimée’s first investigation, Murder in the Marais, is set in Paris’ historic Jewish district, a neighborhood still scarred by the horrors of World War II and the betrayals of collaborateurs. Murder in the Sentier takes her to the 2nd arrondissement, home to many garment manufacturers, as well as the illustrious Tour Jean-sans-Peur, a 15th-century tower built by a Duke of Burgundy named John the Fearless, for which the structure takes its name—the tower itself, a relic from a bygone era, is located at the 12th-century wall that formerly demarcated the city limits of Paris. Murder Below Montparnasse starts with a rendezvous in a cute café on the book’s titular boulevard, the air smelling of flowers and the street shimmering with fresh rain. Romantic? Not in Aimée Leduc’s world. And Murder on the Champs de Mars takes Aimée from the École Militaire, built by Louis XV on that stretch of land named after the God of War, to the Maison des Polytechniciens, an 18th-century structure that, at different times, Queen Margot and Louis de Béchameil (as in the sauce) called home. Over in the 8th arrondissement is Murder on the Quai, which begins with a lovely evening stroll down the Champes-Élysées that quickly turns into a deadly encounter on the docks of the Seine, for which the book is named. The the prequel to Murder in the Marais, Murder on the Quai, begins while Aimée is still in medical school and her father and grandfather are still alive. A crucial entry in the series that enriches the Leduc family backstory, it is also the perfect place for readers to dive in. The titles of other series installments offer a scintillating glimpse of even more Parisian sights: Belleville, the Bastille, Clichy, the Rue de Paradis, the Latin Quarter, and the Palais Royal are just a few of the places many would kill to live. 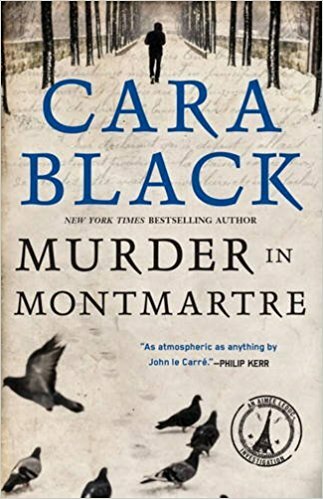 As the first word in each of Cara Black’s titles—murder—indicates, the culprits do exactly that. Whether you have been following Aimée since her first investigation or you’re jumping in with the latest book, Murder on the Left Bank is classic Leduc—chic, charming, and infectious. Like a fine pastry (perhaps that chocolate croissant from Murder in the Marais? ), just one book isn’t enough. Murder on the Left Bank is an exciting new entry in Aimée’s saga, but it is also sure to hook newcomers and introduce them into the thrilling, fashionable, and richly cultural Parisian world of Aimée Leduc. Murder in Bel-Air: The nineteenth mystery in the New York Times bestselling Parisian detective series! "Cara Black takes the classic ingredients of the genre and puts a new Gallic spin on them. The finest PI series now being written.” –Mick Herron, author of This is What Happened and the Slough House series. Cara Black is the author of nineteen books in the New York Times bestselling Aimée Leduc series. She lives in San Francisco with her husband and son and visits Paris frequently. Sign up today and receive additional discounts, happenings, and excerpts.